Can you combine stripes and florals? Yes, you can! Often people will tell you it won’t work. Stripes go with a lot of things and the result will look stunning, full of confidence, powerful. Stripes and florals are a winning combination. Important is that the colors work together, but that is for everything in interior design as well as in fashion. When you choose a two colored stripe, stay with the same color combination for the floral design and you can’t go wrong. Just add a strong color touch or some gold accents and you are done, the result will be stunning. When using a classical, romantic floral design for your wallpaper a stripe will bring a modern touch. Select a very big floral dessin in just 2 colors, if not it can look as you are visiting your grandmother and that is probably not what you want to obtain. What can be more classical than a navy inspired stripe in a white - red - blue combination? It is an evergreen which will fit a kids’ room, a junior room, your summer house, etc. You can give it a twist by using a wallpaper where the leave design is forming a stripe. A stylized floral hanging lamp to give it an eclectic touch, or go even further and combine it with a floral shaped armchair to make the room look outstanding. Taking nature inside and painting a floral mural will turn your space in a very personalized room, one to be proud of every time you enter. Wait till your guests will discover your creative talent. Multi colors, bright and bold is asking for some powerful stripes to go with. Make it even more sparkle and add dots in the colors of the flowers, summer will be in your home all year round. A more dramatic floral wallpaper is asking for a clear statement. 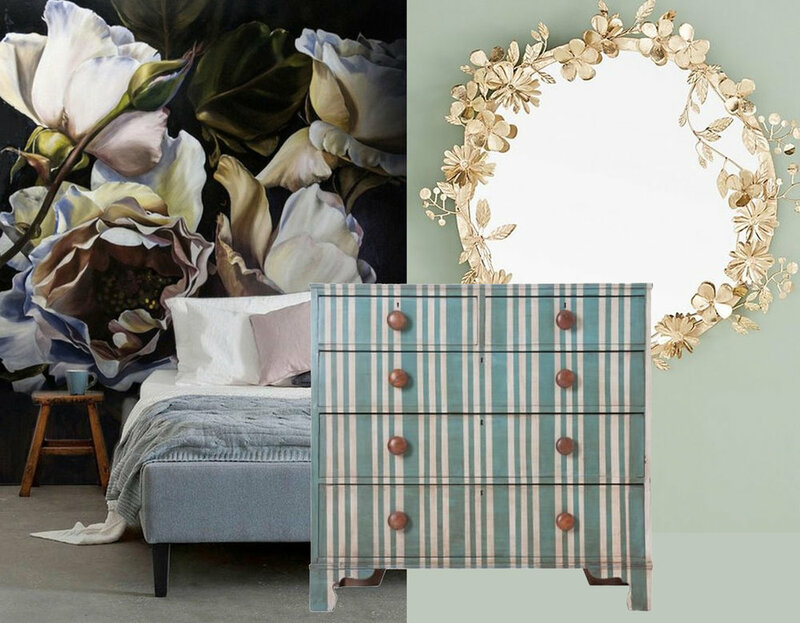 It can look very feminine, so add some pyjamas stripes to bring in a masculine touch. The floral mirror is as a cherry on the cake and will add a sweet note. What can be more English than floral and striped wallpaper? They have a tradition for wallpaper which goes back for centuries. Romantic, poetic, innocent, feminine, all in lovely color combinations. Take a look how they combine those stripes and flowers in one wallpaper or fabric design. Perfect for a small countryside house, or just one armchair in your bedroom to feel as living in a big old mansion. For a little girl, romantic at heart, it will never be to much pink or to much flowers. Sweet pastels, bold classic roses will make her feel as a princess. Make it playful by adding checks, a playful combination of stipes. And add a stronger color such as the yellow wardrobe to make make it sparkle. You don’t need small animals or super sweet florals to decorate the nursery. Choose some sweet but bold floral design for your little girl and you bring in her room immediately a good dose of modern design. Checks and stripes will make it playful. Florals and stripes combined is something for you? Go for it!